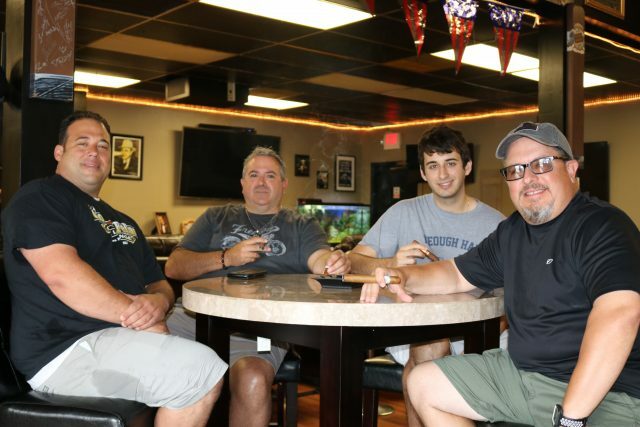 Good Fellas Cigar Bar & Lounge in Somers Point is a haven for cigar lovers. From left; co-owner John Gentile with customers John Collins Jr. and John Collins III, of Avalon, and Mike Genova, of Egg Harbor Township. 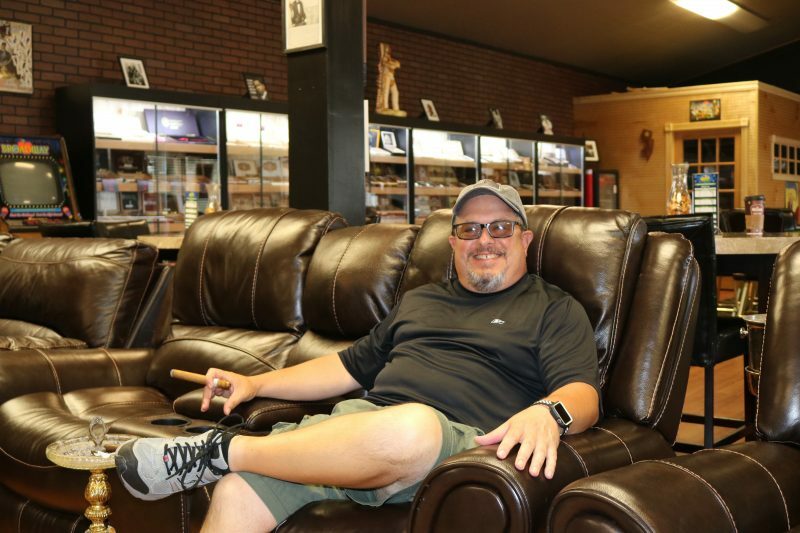 Mike Genova puffed away on a cigar, seated in a plush leather recliner. He wasn’t home, but he just as well could have been. To say he was comfortable might be an understatement. 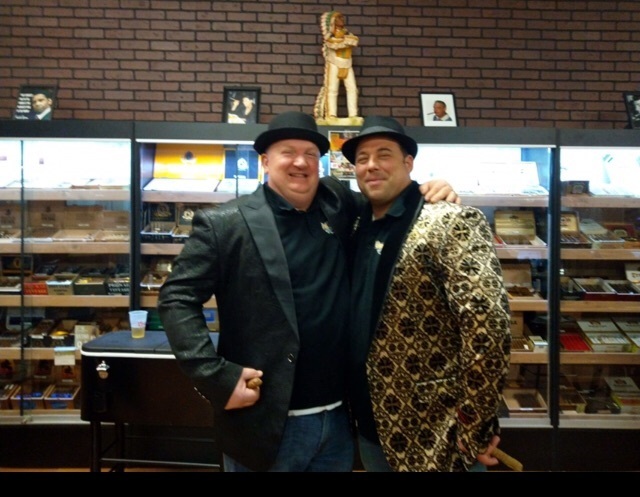 Genova was a customer at Good Fellas Cigar & Lounge in Somers Point, co-owned by friends Greg Naeder and John Gentile. Genova, a systems engineer, said from the first time he walked into the lounge, he felt at home. Mike Genova says the lounge has a homey feel. The lounge has a lot to offer. It has a private club feel, minus an official membership. The setting is dark and spacious. There is a large, old-style felt top card table and the décor is a rich, deep wood. Half a wall is dedicated to a glass case filled with premium brand cigars, the owners said. Posters from gangster movies, pictures of old crooners, and three large screen TVs complete the setting in a lounge that seats about 40 people. Background music, including ballads sung by Dean Martin and Jerry Valle, round out the relaxed atmosphere. But cigars, TV and music aren’t all that Good Fellas has to offer. Patrons can also buy coffee. There are soda and snack machines and once a month the lounge hosts events with pizza and hotdogs topping the menu. 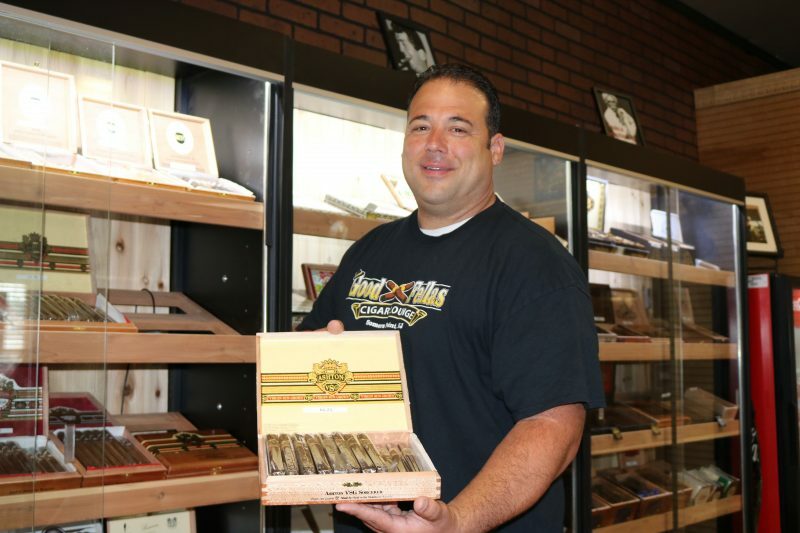 Co-owner John Gentile displays some of the top brand cigars sold at the lounge. And for cigar lovers who get tired of being called “stinky” when smoking, Genova said the ventilation system is excellent at Good Fellas. “You’re still going to smell like cigars, but it won’t be like the old days when people would leave a bar smelling like they smoked 20 packs of cigarettes,” Genova said with a laugh. With a growing customer base, Good Fellas is attracting patrons from as far away as Philadelphia and the Wildwoods. John Collins Jr. and his son, John Collins III, both of Avalon, said the cigar bar is worth the trip. Naeder and Gentile opened Good Fellas five months ago. They are very pleased with the positive response to the lounge. The business began as a great idea and a dream. Naeder, 49, a married father of six and a retired detective with the New York Police Department, bought a summer home in Somers Point three years ago. That is when he met Gentile, 45, a married father of three who owns a heating and cooling business. They two became friends. As any good detective would do, Naeder did some research with Gentile, who also lives in Somers Point. Since the area didn’t have a cigar lounge, the friends decided to open one. “The atmosphere we wanted to create replicates a movie set, where the wise guys had their meetings inside a social club. You know, where the ‘good fellas’ hang out,” Naeder said. For Gentile, owning the lounge still seems like a dream. 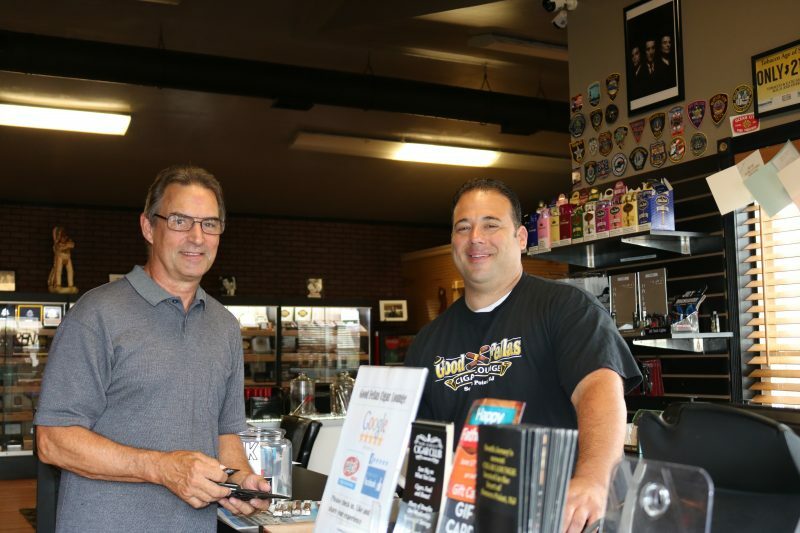 John Gentile helps customer Walt Skulsky, of Egg Harbor Township, in his choice of cigars to purchase. And both he and Naeder are pretty certain their hard work is paying off. 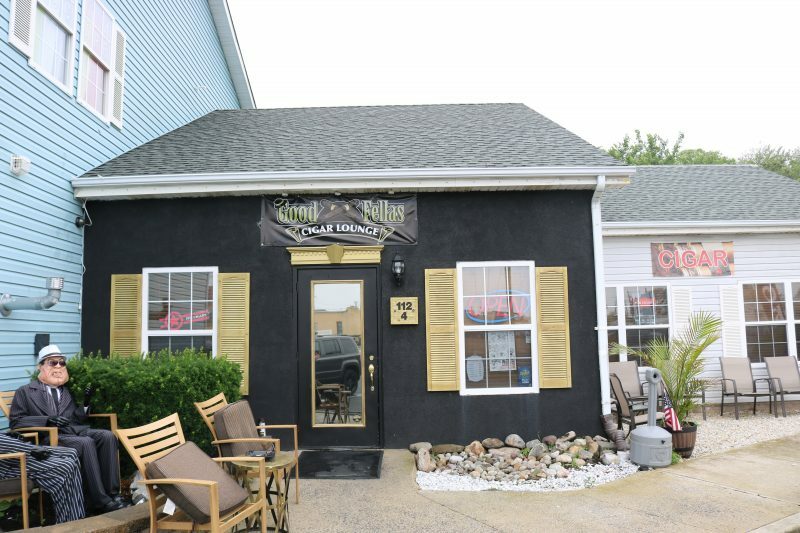 Good Fellas Cigar & Lounge is located at 112 Woodland Ave. in Somers Point and is open daily from 10 a.m. to 10 p.m. For more information call (609) 365-8051. Good Fellas employee Stephanie Abril, of Somers Point, with John Gentile, says it is a fun place to work. 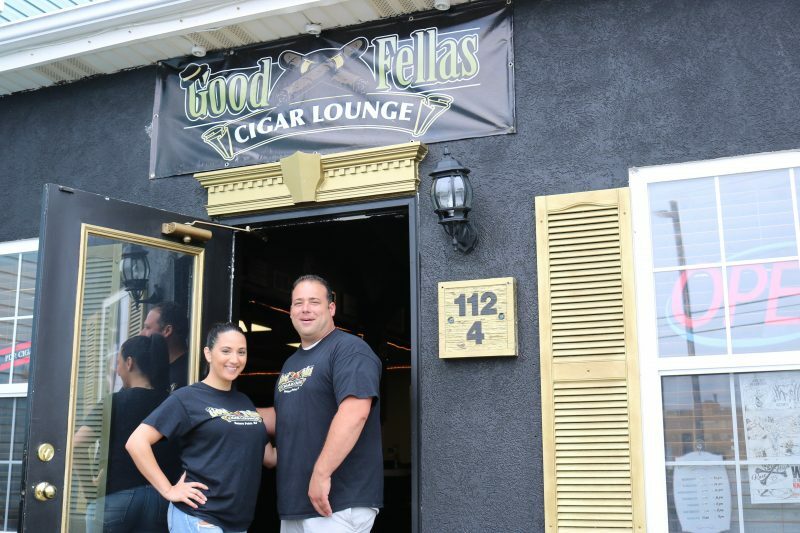 Good Fellas Cigar & Lounge is located at 112 Woodland Ave. in Somers Point.